While the efforts by politicians to rig the electorate and voting process have been common in recent years, they are by no means the only attacks on voters; numerous private individuals and activist groups are also running efforts to disenfranchise voters who don’t support their political goals. Activists and political groups may not be able to alter the law in order to manipulate the vote, but they are able to intimidate, trick, or obstruct voters who are attempting to exercise their right to cast a ballot. The use of dirty tricks by non-governmental groups to affect the vote is a very old tactic and has been fairly common in our country. Large aggregations of power and money are able to trick or intimidate individuals into conforming with the views of the collective, thus they are able to have a real effect on the vote. In most cases historical cases of non-governmental voter manipulation, the methods used to achieve the manipulation can be put into one of three categories: intimidation, bribery, or disinformation. Intimidation: Threatening people at the polls or with consequences if they vote for a specific candidate (ex. unions compelling members to vote in a block or face isolation, people showing up at the polls and acting openly intimidating towards certain voters, etc.). Bribery: Buying votes for a specific candidate or party with money or material gifts (ex. offering money to people who show a voter receipt that has them voting for a favored candidate). Disinformation: Spreading false information about the time, place, and mechanisms of voting, in an attempt to make it harder to vote (ex. sponsoring robo-calls to people registered to a party that give the wring times and places for voting). In preparation for the 2012 election, numerous right-wing groups have gathered, organized, and trained large numbers of “poll watchers”. These “poll watchers’ are tasked with going to polling places on election day in order to look for “voter fraud” and challenge the voting eligibility of people who they suspect to be illegitimate voters. Once these people challenge voters, the voting officials may force the voter to vote provisionally (depending upon the state), or the line is simply held up and voting takes longer—in either case, these people represent an obstruction and serve no constructive purpose. As the poll watchers have no information about individuals, they rely solely upon appearances and bias to base their challenges upon—put plainly, they are an excuse for white conservatives to go into minority neighborhoods’ polling places in order to harass, obstruct, and intimidate voters on Election Day. The largest of these groups is an extension of a Texas-based Tea Party organization called “True the Vote”. True the Vote has thousands of volunteers, who they deploy in minority or lower income neighborhoods to challenge voters; they very rarely are present in voting areas which are upper-income and are essentially never present in voting places that are certainly Republican. To further compound the obvious partisanship of this group’s operations, they have donated thousands of dollars to Republican groups and have distributed Republican propaganda about alleged Democratic “voter fraud”. When partisan ideologues are sent to the polls, with the express objective of using a person’s appearance to spot their eligibility for voting, there are several severe problems which are created. First and foremost, letting activists of a party go into a polling place and selectively challenge voters for removal based upon appearance is anti-democratic and a platform for racist voter disenfranchisement. Secondly, these “poll watchers” obstruct the voting process and increase the lines at polling places with their specious challenges—this makes voting harder in targeted areas (mostly poor and minority areas), and serves to make voting more difficult for these people. Finally, the intimidation factor of having people at the polls single out voters is not appropriate and should be banned, just as no group is allowed to electioneer inside of the voting place. All in all, “poll watching” represents a misguided and partisan attempt to obstruct the election in districts where the poll watchers want to suppress voting. 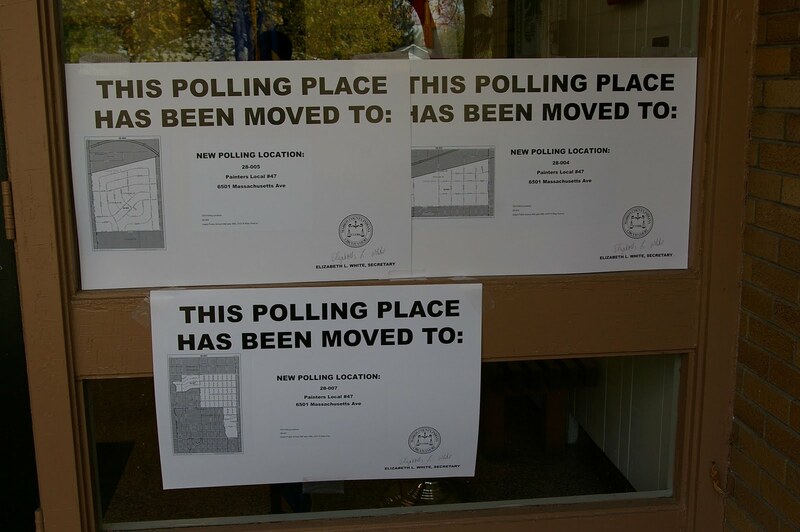 By targeting areas that are unlikely to vote for Republicans, the Tea Party poll watchers make it more difficult and time-consuming to vote in these places, and, in some cases, are able to completely block people from passing regular ballots. Probably the most common and widespread tactic for suppressing the vote is to spread disinformation about when, where, and how to vote. By sowing confusion in the population about how to exercise their rights, and targeting this confusion at groups that are unlikely to vote in their interests, partisans are able to make it harder for their opponents’ supporters to vote. Such ads can give incorrect scheduling information (ex. claiming that the election is on the wrong day), incorrect voting requirements (ex. demanding voter ID at the polls), or can attempt to confuse people as to how they are able to vote (ex. saying that a ballot will be sent out to everybody and that showing up at the polls is unnecessary). During the 2012 election cycle, we saw numerous examples of disinformation campaigns that were aimed at convincing people that voter ID laws were in effect, even in places where they weren’t. These campaigns convince people that they need ID, even if the law doesn’t agree, thus they prevent some voters from ever even trying to go to the polls. 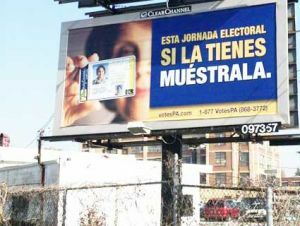 The ad above is incorrectly claiming that voters should supply ID at the polls during the 2012 election, and is targeted at Spanish-speaking citizens. This billboard is an example of a voter disenfranchisement ad that seeks to trick people of a specific demographic group into thinking that they are unable to vote. The method of targeting this ad is through language and location (Spanish in a primarily Latino neighborhood of Pennsylvania), but others have simply been targeted through geographic location—groups have posted such ads in majority African-American neighborhoods, but not in majority white neighborhoods. Not only have the 2012 election cycle’s disinformation ads been focused upon voter ID requirements, but they also have attempted to make certain groups vote on the wrong day. 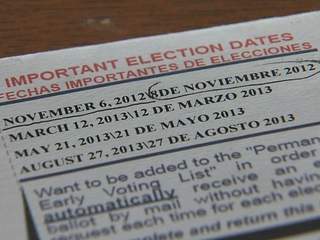 The Maricopa County election board in Arizona printed the incorrect date for voting in the Spanish version of many of its voting documents—this was not limited to a single instance and was included in several different translations. As is obvious, such an ad is attempting to give Spanish-speakers the wrong information and trick them into voting on the wrong day (robbing them of their vote). This tactic will only likely affect low-information voters who speak Spanish, but it represents a very clear example of an attempt to disenfranchise Spanish-speaking voters. Our voters, particularly in swing states, have been exposed to a great deal of misinformation during the 2012 election cycle. This misinformation is specifically designed to attack certain voting groups—most of whom are racial minorities—and swing the election in favor of the Republicans. Attempting to win an election through preventing the other side from voting is wrong, un-American, and should be decried by every American voter, regardless of partisanship. In the months before the 2012 election, we have seen numerous businessmen attempt to manipulate their employees’ votes through threatening their jobs or benefits if Obama wins the election. As employers hold immense power over their employees, this type of manipulation is a very dangerous an unfair tactic that preys on the workers’ fear of being fired. Workers are faced with the danger of losing their livelihood, and with it their health insurance, if they vote their consciences against the wills of their bosses—this situation is intensely anti-democratic and represents a massive threat to the American democracy. Romney himself appears to support attempt by CEOs to manipulate their employees’s votes. During a recent talk with a business group, Romney said “I hope you make it very clear to your employees what you believe is in the best interest of your enterprise and therefore their job and their future in the upcoming elections;” when put into context, the meaning of this request is simply to ask CEOs to threaten their employees into supporting corporate-friendly (right wing) candidates. Robert Murrey – The owner of Murrey Energy who has not only threatened repercussions against employees if Obama is elected, but also forced workers to attend Republican campaign events without pay and compelled them to give money to Republican groups. David Siegel – The CEO of Westgate Resorts threatened to downsize his company and fire many of his workers if Obama wins re-election. Scott Farmer – The CEO of the Cintas uniform Company threatened to stop covering employee healthcare and decrease wages if Obama is re-elected. Without a doubt, these attempts by CEOs to control their employees’ votes are unethical and a complete perversion of the democratic process—a vote is meaningless if you can only vote for one candidate without risking your job and the security of your family. Unfortunately, these CEOs have shielded themselves by never explicitly saying that their employees should vote for Romney, only that a vote for Obama would put their jobs at jeopardy; through wiggling through this loophole, they will likely avoid any repercussions for their actions, but that does not mean that they shouldn’t be condemned for their behavior. Despite all of the talk about “voter fraud” many people have failed to see the true source of election fraud in our country: voter disenfranchisement. If we consider the total number of eligible voters as a zero-line (100% accuracy in voting) for the election, any deviation from this number is potential “voter fraud”—people who vote illegally cause a positive deviation from the ideal point, while people to be illegally disenfranchised cause a negative deviation from the ideal point. Put plainly, every person to vote while ineligible has the very same distorting effect on the election as every person to be illegally disenfranchised. Every person to be turned away at the voting booths is a case of voting fraud by those who intentionally limited the vote. In comparison with the dozens of confirmed “voter fraud” cases, thousands of legal voters are currently facing voter disenfranchisement. Simply by looking at the numbers, we see that the true danger of voter fraud exists in the blocking of the vote, not voters attempting to get their votes counted multiple times (or appearing at the polling places pretending to be Mickey Mouse). Everybody who cares about democracy and the ideal of fair elections needs to clearly make the case that voter fraud isn’t just perpetrated by those attempting to vote illegally; it is also present in cases where those who should legally be able to vote are not allowed to. Every voter to be illegally disenfranchised should be portrayed as a case of voter fraud by the legislators and activists who attempt to rig the vote in their favor. While many might see non-governmental voter manipulation as a non-partisan issue, it remains true that a vast majority of the confirmed cases of such manipulation have been perpetrated by the right wing. As the conservatives have a strong interest in keeping the electorate small (historically, they gain more power as fewer people vote), they are the ones who benefit from voter disenfranchisement. In addition to this, the alignment of corporate interests with the right wing agenda (lower taxes/regulation, reduced worker protections, etc. ), has led corporate groups’ voter manipulation to become almost exclusively in favor of the right wing. Whether by design or by chance, the problem of modern voter manipulation exists as a conservative effort to condense the vote. 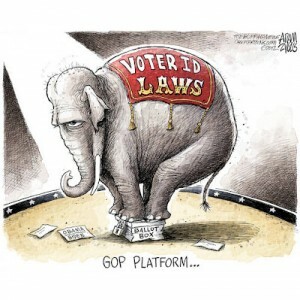 Voter disenfranchisement today is primarily the Republican Party’s attempts to suppress the voter turnout and eligibility of certain types of people who tend not to vote for them or their allies. In modern times, the Democratic Party has virtually no history of voter suppression—in fact, the higher the total numbers of voters, the better chance Democrats have to be elected. Groups which vote disproportionately democratic are: Students/the young, first time voters, the poor, union workers, and minorities. All of these groups are in some way harmed by the recent voter suppression bills and campaigns that have been enacted in the states recently.